I’m a freelance writer and editor. I live in New Hampshire’s White Mountains with my husband and children. 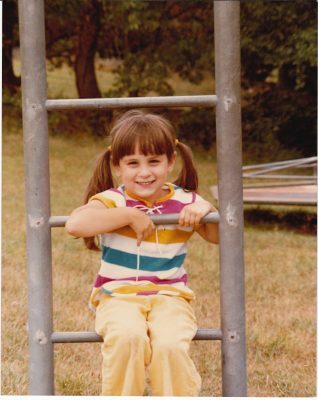 In this photo, circa 1980, the only thing I worried about was how I could wear that shirt every day without having my mother wash it. Not so today. When I’m not obsessing over the state of the world, the future of this country, the burning planet, or my children’s futures, I read, write, and savor the mess and beauty of living and raising two curious kiddos. I write about parenting, the environment, and technology. You can read my personal work in the New York Times Smarter Living Newsletter, Grok Nation, the NOLS Blog, and Green Matters. Check out my Clips! I also write blog posts for companies and organizations focused on education, like the VLACS Blog and Keystone Academic Solutions. Check out my Copywriting!